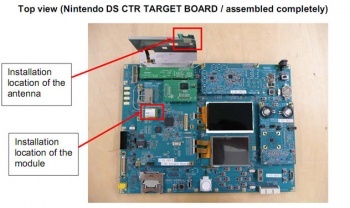 What Secrets Does the "Leaked 3DS Motherboard" Reveal? According to hardware analysis, the supposed images of the 3DS motherboard reportedly leaked from an FCC filing indicate that Nintendo's new handheld could support widescreen and a control nub similar to the one on the PSP. In the past few days, an image has surfaced on the internet that is allegedly the motherboard for the hardware that 3DS games are being tested on (and developed for). The image in question was reportedly leaked from a Nintendo filing submitted to the FCC - though naturally, nothing has been confirmed. The folks over at GameUsagi blew the image up to take a closer look, and look they did. Now, I'm no hardware expert - frankly, this entire thing looks just like blue plastic with little dots on it to me - but from what they can see, the 3DS may have some features that its predecessor is lacking: namely, widescreen support and an analog control nub. The most obvious item on this motherboard is the wide-screen screen. A departure from Nintendo's almost exclusive 4:3 past, this could certainly be an interesting development. If we assume that the bottom screen is roughly the size of a DSi screen, then that makes the top screen very nearly the same size and dimensions as an iPhone screen. There are a lot of cables running off of the top screen and each one essentially would do something different. With the 3-4 connectors attached to the top screen, that could hint at something like touch input, backlight, and two display "angles" for the glasses-free 3D effect for the top screen. The 3DS also has inputs for SD and current DS cards, roughly the same button layout as the DS (analog stick, four face buttons), and a headphone jack. Again, take all of this with a grain of salt. But the way the 3DS is shaping up, it might be a very clear step above its predecessor when we see it this year at E3.